LeAnn Erickson: The Computer Wore Heels. 2014. 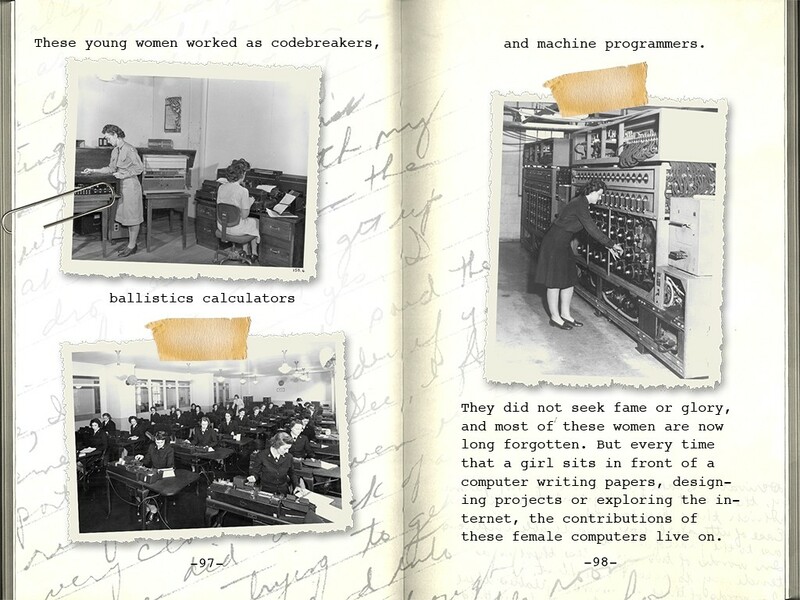 The Computer Wore Heels is an interactive book app for the iPad that shares the little known story of a group of female mathematicians, some as young as18, who did secret ballistics research for the US Army during WWII. A handful of these human ‘computers’ went on to serve as the programmers of ENIAC, the first multi-purpose electronic computer. The app is based on the documentary film Top Secret Rosies: The Female Computers of WWII (LeAnn Erickson 2010), and aims to bring this story to younger students in the hopes of giving today’s teens role models that might encourage them to study math, science and computer science. The app’s design resembles a girl’s diary from the 1940s with the narrative unfolding as an adventure story. Readers may access primary research documents such as original WWII era letters, photographs and mathematical equations actually completed by the story’s subjects. There are also numerous audio and video clips that expand on story plot points or events. Denne interaktive dokumentaren om unge, kvinnelige matematikere under annen verdenskrig bruker materiale som tekst, videoer, brev, fotografier og matematiske formler for å fortelle om et stykke historie. Appen er basert på Ericksons dokumentarfilm om samme tema.